Seccom Global - The Cyber Security Company - have announced they will be presenting two sessions at CeBIT 2016 titled "Insider Threat: The biggest cyber security problem". CeBIT will be held in Sydney Olympic Park between 2-4 May, 2016. Seccom Global – The Cyber Security Company – have today confirmed they will be giving two Showfloor presentations at the upcoming CeBIT event, scheduled for 2-4 May, 2016. CeBIT is one of the most important IT exhibitions in Australia, attracting over 15,000 attendees to more than 300 exhibiting organisations. This year the topics covered at CeBIT will include managed services, ecommerce, digital marketing, education, unified communications and much more. There’s a possibility that CeBIT 2016 will be opened by Australian Prime Minister Malcolm Turnbull, but this is yet to be confirmed. 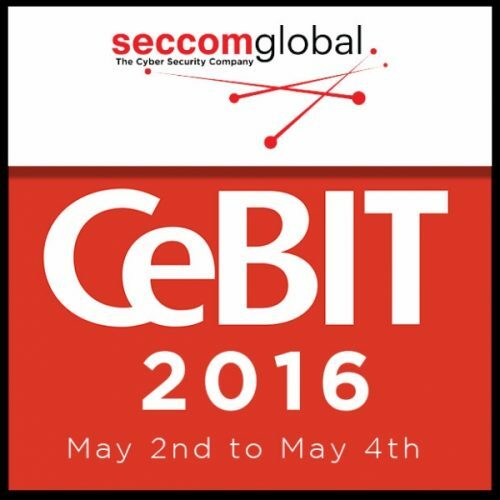 The team from Seccom Global will be delivering two cyber security presentations at CeBIT this year. Both sessions will be addressing the topic of “Insider Threat: The biggest cyber security problem”. The first presentation will be from 2.00pm to 2.30pm on the 2nd of May, while the second will be from 11.20am to 11.50am on the 3rd of May. Michael explained that insider threat may be a disgruntled employee or contractor of the organisation, or it may be an outsider who seeks to trick an employee into revealing their access credentials in order to damage the organisation in some way. The potential damage caused may include introducing malicious code to the network (a virus, trojan or worm), exposing or stealing confidential or proprietary information or financial theft. Some large companies have suffered insider threat incidents which cost over $1 billion. Unfortunately this is a growing trend which shows no sign of slowing down. CeBIT attendees who are present during Seccom Global’s cyber security presentations will discover more about the risks presented by insider threat, as well as various steps they can take to protect their own organisations from attack. Michael Shine hopes Seccom Global’s presentations will help Australia’s IT to make informed decisions regarding insider threat and avoid becoming another cyber security victim.